Buying a computer can be a daunting task and knowing what to get will depend on your needs and requirements. 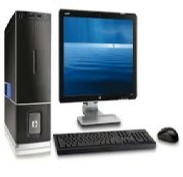 Desktop computers tend to be easier to repair and upgrade and you generally get more for your money. If you have the space in your house or business and don’t need to use your computer in different locations, we would always recommend getting a desktop computer. With a desktop you have options for the size of screen and keyboard and mouse options. Often they come with higher capacity disk drives and memory. You can have wireless mouse and keyboard, but these are not always as reliable and run off batteries. Desktops generally do not come with in-built WIFI although this can be specified in some cases and there is always the option to use a WIFI adapter. You have greater expansion options normally with desktop computer, more USB ports, DVI, HDMI and VGA options for connecting screen, screens and then sound input and output connections are more in number. Some manufacturers provide integrated computers where the screen contains the processor and all the components of the computer including the storage device. These are less easy to repair as a rule. Manufacturers also build compact desktops, but some of the components in them are less easy to resource when repairs are required. Desktops are often more reliable and you get the opportunity to have a second drive more easily than with laptops. Find out about laptop computers.